Select from six different models, with power output from 2000 to 7000 watts per channel, including two four-channel versions. Regardless of your system size or program material â€“ from delicate classical to slamming hip-hop â€“ your FOH arrays and monitor wedges will realize full performance potential under FP+ Series power. All FP+ Series amplifiers share common family traits. All are built around the same core technologies, including patented Class TDÂ® output stage topology, R.SMPS regulated switch-mode power supplies, and proprietary copper-finned Intercooler heat dissipation systems. All offer real-time monitoring and control via the NomadLink network, with network modules included as standard equipment. And no matter where your tours may take you, all FP+ Series amplifiers are followed by Lab.gruppenâ€™s six-year, no-quibble warranty. Built in Sweden to tour the world The Lab.gruppen FP+ Series was designed and engineered to achieve unprecedented channel and power density. 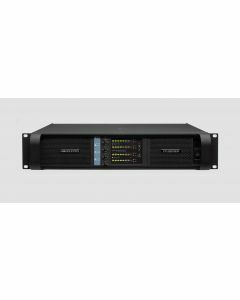 Simply put, FP+ amplifiers allow you to configure racks of any size â€“ for any mobile reinforcement application â€“ using fewer, smaller, and lighter amplifiers. A very few compact racks, each easily maneuvered by a single person, now can power an arena-sized system with headroom to spare.